The holidays are a good time to venture out when shopping for the season. There are quite a few Exchanges in the area and each has its own personality and promotions. One thing they all share is tax-free shopping. In Washington state, that is a huge benefit, which can save you almost 10 percent in addition to everyday savings. The Exchanges do price match so if you see an item at a lower price, bring in the flyer and they will match the price, tax-free price. While all the Exchanges offer discounted shopping, each are known for different things. The JBLM - Lewis Main PX, or Post Exchange, is the spot to shop for the sportsman in your house. For those who like to shoot, there is a mini gun shop, ammo and shooting accessories. There is plenty of athletic equipment available for purchase for a wide variety of sports as well as the athletic garb to go with it. Also, check out the Seahawks fan wear. The JBLM - McChord Field BX, or Base Exchange, has a huge electronic section with great prices on jumbo television sets. This is also where to go for furniture and appliances. The high-end cosmetic section is nice and large with many name brand options at a discount. The accessories section of designer women's purses is larger than the Fort Lewis PX and has quite a large selection of Coach purses and other name brands. Venturing further afield to the Kitsap Peninsula, you visit Naval Base Kitsap, which consists of the former Naval Station Bremerton and the Naval Submarine Base, Bangor. Bremerton has a small Navy Exchange (NEX) if you are in the area, but the sub base has the larger Exchange. This store has a different selection of products than JBLM. Inside there is a Pacific Northwest shop with a variety of local items and souvenirs for sale. 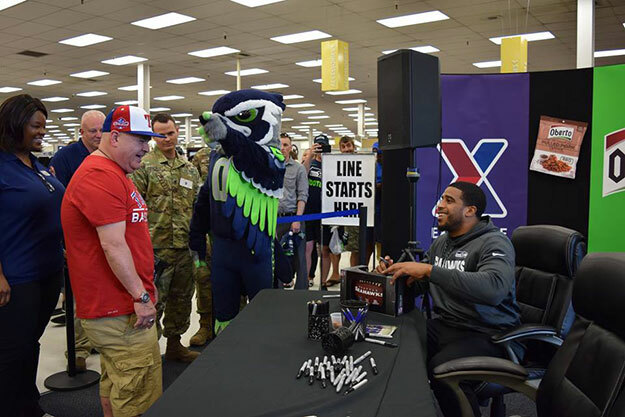 The NEX also runs promotions that are different from JBLM. It's tiny, but at the end of Ediz Spit near Port Angeles is a Coast Guard Station, and there is a small Exchange. It's a nice little stop if you are on the Olympic Peninsula. On Whidbey Island, there is a large Navy Exchange at Naval Air Station Whidbey Island in Oak Harbor. This large shopping store is in an old hanger and has a good selection if you are in the area. If you usually shop at your closest exchange it can be well worth a drive to try out a new location as each one has a different selection of items. It is also worth calling and checking prices. Sometimes the NEX will have different promotions than what the Army Air Force Exchange Service (AAFES) offers. Remember, both will match prices if you have a flyer showing the sale price.